Rising Italy star Moise Kean was targeted by racist abuse after he scored for Juventus on Tuesday — but teammate Leonardo Bonucci blamed him for inciting the crowd at Cagliari. Goals from 19-year-old Kean and Bonucci gave Juve a 2-0 victory over Cagliari that took them closer to an eighth consecutive Serie A title. Kean slotted in his fourth goal in as many league games in the 85th minute after Bonucci nodded in the opener on 22 minutes in Sardinia. The youngster’s celebration after scoring, however, infuriated the home crowd who had jeered the teenager throughout after he was booked for diving in the first half. Kean, along with his French teammate Blaise Matuidi and Brazilian Alex Sandro, were targeted by monkey noises throughout the match, but they increased in intensity after the second goal. The Juventus teenager celebrated with his hands outstretched in front of the Cagliari fans after scoring, taking to Instagram later to defend his actions as “the best way to respond to racism”. But Bonucci claimed that Kean should not have provoked the home supporters and said his teammate was partly to blame. “Kean knows that when he scores a goal, he should celebrate that with his teammates. He knows he could have done something differently too,” Bonucci told Sky Sport Italia. “There were racist jeers after the goal, Blaise heard it and was angered. I think the blame is 50-50, because Moise shouldn’t have done that and the Curva (Cagliari fans) should not have reacted that way. Coach Massimiliano Allegri agreed Kean “shouldn’t have celebrated in that manner”. 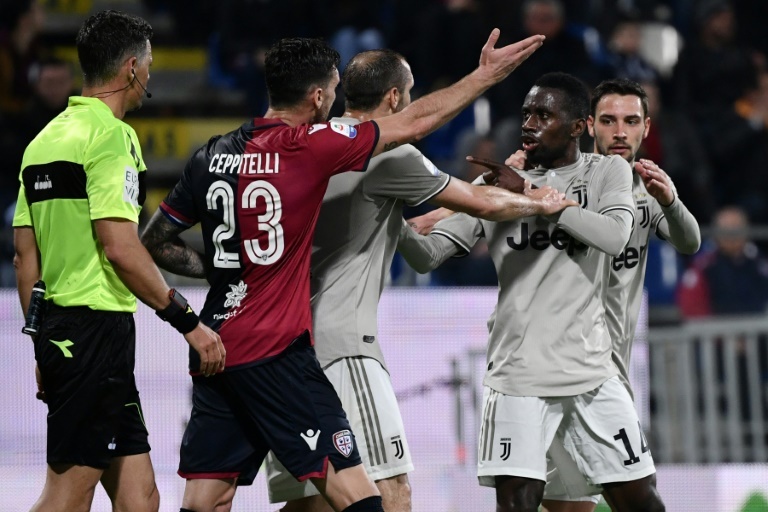 Juventus captain Giorgio Chiellini (C) attempts to calm down Juventus’ French midfielder Blaise Matuidi (2ndr)Cagliari fans appeared to throw objects at Kean, and the match was momentarily stopped and an appeal made over the stadium speakers. Former Paris Saint-Germain player Matuidi appeared furious at the jeers at the same stadium where he was targeted last season. The abuse came on the day that UEFA president Aleksander Ceferin said he was “ashamed” by the recent outbreak of racist abuse and vowed to ask referees to stop matches in the future if racist chanting breaks out. Allegri called for the culprits to be identified and banned. “As usual, there are some idiots, but also normal people,” Allegri said. “We have cameras, we identify them and not one-year ban or two, just give them a lifetime ban. 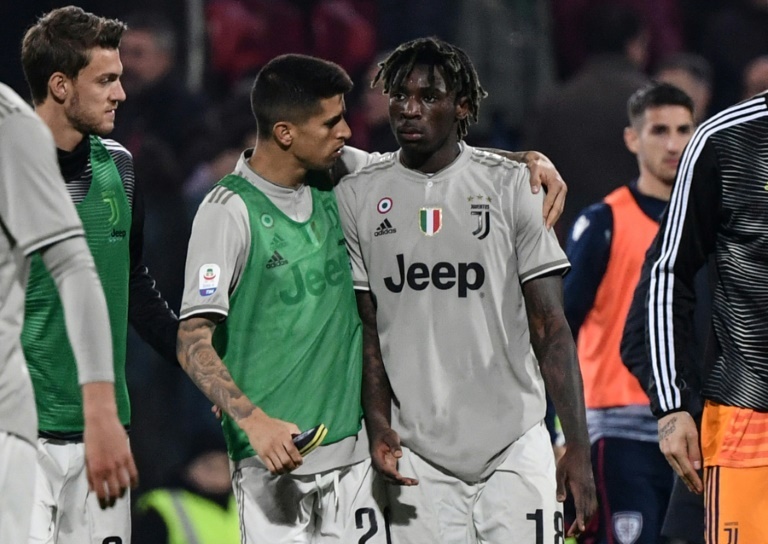 Cagliari president Tommaso Giulini, however, blamed Kean for stirring up tensions and said criticism of his club’s supporters was “self-righteousness”. “If (Federico) Bernardeschi had done what Kean did, the reaction would have been the same,” said Giulini. “Nobody had heard anything up to that point. Kean made a mistake, he’s 19, that’s understandable,” he added, saying he “mostly heard whistles”. The champions’ next game is at home against AC Milan, who were held 1-1 by Udinese. Juventus shrugged off the absence of star duo Cristiano Ronaldo and Paulo Dybala, with Mario Mandzukic also out suffering from flu. Cagliari goalkeeper Alessio Cragno denied Kean twice before the teenager finally broke through, scoring from Rodrigo Bentancur’s pass. Kevin Lasagna grabbed a point for Udinese to further dent AC Milan’s Champions League ambitions. “We’re playing with the hand brake on,” said AC Milan coach Gennaro GattusoPolish striker Krzysztof Piatek managed to break through just before the interval after connecting with a Patrick Cutrone cross. 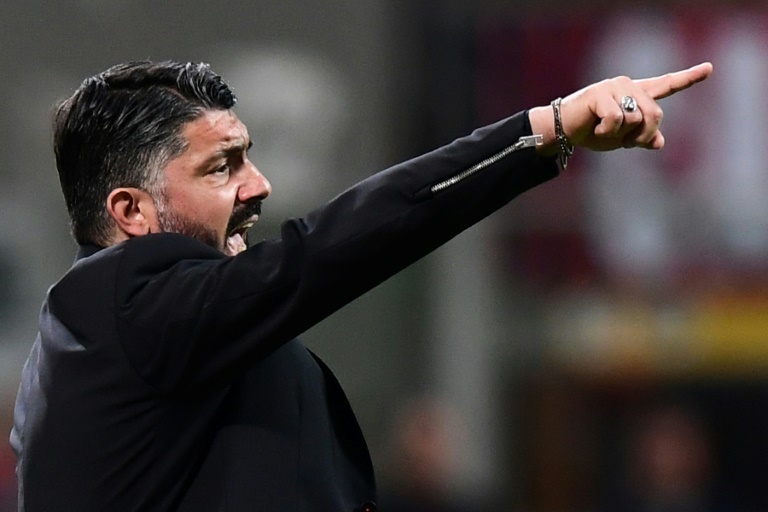 The stalemate complicates the Champions League race for Gennaro Gattuso’s side who are targeting a return to the competition for the first time since the 2013-2014 season. They are fourth, in the final Champions League spot, but Lazio are four points behind with two games in hand ahead of their trip to struggling SPAL on Wednesday.